The Dorado Speed Swim Club (DSSC) is celebrating its 25th year as a club this month. They have already completed a successful Inter-Club Meet on Sunday last among other activities held. Kaieteur Sport is pleased to share with you our readers, a history of the club which has as its motto: “Winning Is Our Attitude”. Our Story: Our Head Coach, Stephanie Fraser reintroduced a Learn-to-Swim programme at the Hotel Tower in 1989. The response was overwhelming and the then participants were both talented and dedicated. Ms Fraser was impressed with the progress and skill of her young charges. Being the visionary she is, the hard working Fraser decided that such talents needed to be nurtured and channeled to competitive levels. 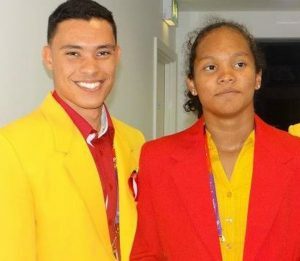 In a bold step of faith, she got together with the parents, presented her plan and a competitive club was formed that would change swimming history in Guyana. The Dorado Speed Swim Club (DSSC) was officially accepted as an affiliate of the Guyana Amateur Swimming Association (GASA) on March 23, 1993. Britany van Lange and Niall Roberts just before the London 2012 Opening Ceremony. The first Executive Committee comprised of: Stephanie Fraser (President and Coach), Reginald Rodrigues (Vice-President), Rupa Harisingh (Secretary), Bibi Bandoo (Treasurer), David Fraser (Assistant Secretary/Treasurer), Committee Members: Edna Rodrigues (Coach), Seema Persaud (Parent Representative). The Name: Selecting a name for the club proved quite a challenge. Multiple suggestions were proposed, but none seemed to be the right fit. After several deliberations El Dorado was the front runner; this was because of its meaning “City of Gold”. However, a few parents expressed concern that the name had a strong affiliation to our world class signature rum. After much debate, and on consultation with a marine biologist, the “El” was dropped leaving Dorado. DORADO is a marine fish, also known as Mahi Mahi and can be found in off-shore temperate, tropical and subtropical waters. The body of the Dorado allows them to be very fast and efficient swimmers; travelling at a tremendous speed (92.6 km/h, 57.5 mph) in a short space of time. This beautiful fish with its spectrum of vibrant colours – gold, blue, green, purple and silver – makes a magnificent spectacle. The Executive chose two of the brilliant colours of the mascot (Blue & Gold) as the official club colours. True to its name, being fast, tantamount to being visionary, the club distinguished itself by initiating and leading the resuscitation of the defunct Guyana Amateur Swimming Association (GASA). Over the last 25-years, Dorado has been able to successfully engage the services of several notable personalities as Administrators, with a wide range of business, legal, political, programme management, health and organisational and management skills such as: Mr. Hamilton Green, Ms. Pat Liverpool, Mr. Anthony Xavier, Dr. Jennifer Basdeo-Green, Dr. Karen Pilgrim, Ms. Barbara Freso, Mr. Leslie Soders, Ms. Sandra La Rose, Ms. Marcia Velloza (Sylvester), Mrs. Shianne Latchmansingh, Ms Jean La Rose, Mrs. Pat Helwig, and the list continues to grow. Prominent Fund-raising members were, Ms. Joanne Lowe, Ms. Marcelle Blackman and Mrs. Maureen van Lange. Achieving and maintaining the status of being the number one club both in terms of quality swimmers and financial stability is no small feat. Dorado continues to stand upon the hallmark qualities of integrity, discipline and, above all, staying the course of keeping the focus on the swimmers, still their best investment. 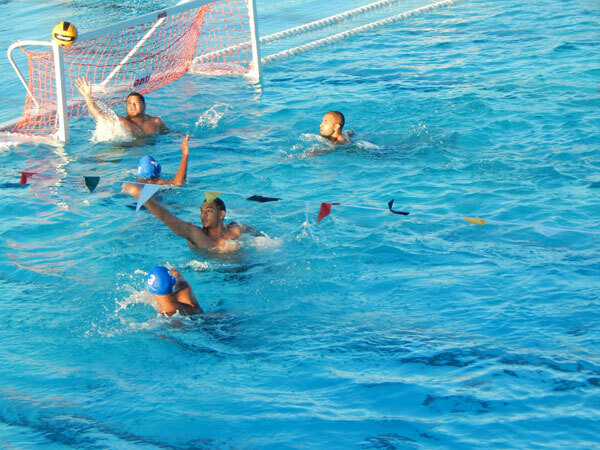 DSSC members involved in Water Polo – July 19, 2015. [1997-2003) Open water swimmer – Sean Hamilton, Edna Rodrigues, James Campbell. [1993-2003] GASA National Age-Group Championships: Nicholas Fraser, Dee-Anne Fraser, Marlon Henry, Danny Persaud, Ravel La Rose, Nadia Bhola, Shelly Anne D’Amil, Asanti Mickle, Andy Rodrigues, Justin and Jeremy Jairam, Roschmann Rodrigues, Alan Lowe, Errol Van Lange, Christina King. [2003-present] GASA National Age-Group Championships: Yannick Roberts, Jamaal Sobers, Henk Lowe, Noelle Smith, Soroya Simmons, Omar Adams, Antonio Hussein, Athena and Hannibal Gaskin, Britany Van Lange, Niall Roberts, Lian Winter, Alex Winter, Donna Carter, Daniel Scott. 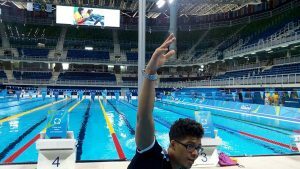 Making it all worthwhile, the Club captured coveted spots at the world’s highest level of FINA forums producing 3 of 5 Olympians to represent Guyana to date. Many of the abovementioned swimmers have gone on to attend prestigious universities, have successful careers and their respective parents continue to credit the discipline and integrity instilled by the management and training model of the club. Dorado is the Club that persistently requested a “50 meter” pool, whether through fund raising or informal forums, even though many may have forgotten, strategically utilising every opportunity to send “friendly” reminders to the Business and Political communities. Today, both competitive and non-competitive swimmers are benefitting from a 50m pool and the Club had the honour of hosting its 25th anniversary meet at that pool, The National Aquatic Center. 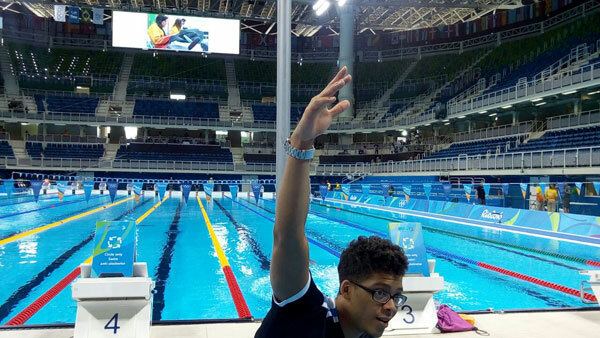 Hannibal Gaskin at Rio 2016. Dorado continues to forge ahead, encouraging strong family values, and remains steadfast in its belief that sports (swimming) and academics complement each other. Dorado’s swimmers and parents acknowledge that it is the best return for investment and the most rewarding fulfillment when you can add value to a person’s character and development. Present Executives: President (Maurice Watson), Vice-President (Han Granger-Gaskin), Secretary (Shonette Winter), Treasurer (Marcel Watson), Assistant Secretary/Treasurer (Karen Pilgrim), Committee Members: Christopher Williams, Jason Allen, Christopher Woodroffe, Stephanie Fraser, Kathryn Chan-a-Sue, Kamala van Lange and Colleen Roberts. Coaches: Stephanie Fraser, Jaime Skeete, Shyka Gonsalves, Nicholas Fraser, Ewin Enmore and Marcel Watson. Instructors: Damien Pilgrim, Steveanna Mootoo and Denroy Trotman. Our deep gratitude: This is a suitable time to express our appreciation to the parents and guardians of all our swimmers for their commitment, efforts, contributions and resisting the temptation to hit the “snooze” button on the alarm clock – for having the swimmers on deck at 05:30hrs and returning again in the afternoon. To the past and present Coaches – thank you for the passion and commitment that you brought and bring daily to the deck, putting aside all other challenges, thus ensuring our Club remains, the best. Where is the iron koolie Drugbeer he can show these guys what swimming is all about.